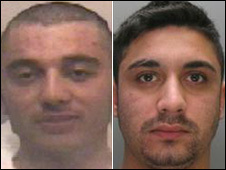 One of two brothers who have been found guilty of murdering three drug dealers in a gangland-style execution has been jailed for life. 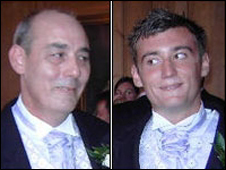 Keith Cowell, 52, his son Matthew, 17, and Tony Dulieu, 33, from Essex, were killed at the Cowells' Hertfordshire house on 28 August 2007. Miran Thakrar, 24, of no fixed address, was sentenced at St Albans Crown Court to serve a minimum of 42 years. Kevan Thakrar, 21, of Lomond Way, Stevenage, will be sentenced later. The Thakrars were also found guilty of the attempted murders of Christine Jennings, 54, and Matthew Cowell's girlfriend, Clare Evans, 23, at the house in Bishop's Stortford, last August, and of possessing a firearm. The men had met at the house to do a cocaine deal, but Miran Thakrar, a small-time drug dealer, was angry he had been sold poor quality cocaine previously by the Cowells, and was out for revenge, the court heard. The Cowells had obtained their cocaine from another dealer, Ian Jennings, who was also at the scene, jurors were told. Thakrar, 24, shot the family dog, Gorgeous, and then lined up Keith Cowell, Matthew Cowell and Mr Dulieu and shot them dead in the house in Plaw Hatch Close, as his brother Kevan looked on. The men then also shot and stabbed Christine Jennings, Mr Jennings' mother, and attacked Clare Evans with a knife as she tried to shield her three-year-old daughter. Ian Jennings escaped by hiding in the back garden. 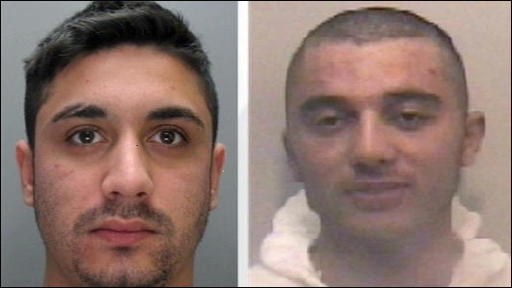 Passing sentence, Mr Justice Cooke told Miran Thakrar: "This was a cold-blooded multiple murder carried out in a savage way. "In the case of the three men, you shot them with a sub-machine gun as some form of execution because of a prior drug deal where you were dissatisfied. "None of the three were armed and you lured them to the Cowells' residence in order to kill those responsible. "There is not the slightest evidence of any remorse and your punishment must be severe." The jury also found Miran Thakrar's girlfriend, Amanda Dansie, 21, of High Street, Buntingford, Hertfordshire, Yilay Tufensoy, also 21, of Nags Head Road, Enfield, north London, and the brothers' father, Atul Thakrar, 47, of Lomond Way, guilty of assisting an offender. They were each jailed for four years. Yilay Tufensoy was also found not guilty of another charge of assisting an offender. Jay Thakrar, 25, was also acquitted of the same charge. Charlotte Cowell, 23, the daughter of Keith Cowell and sister of Matthew Cowell, said: "Nothing can change what has happened or alleviate the impact, pain and suffering that this has had on ourselves, other family members and the vast numbers of friends and family to whom my dad, Matt and Gorgeous, our puppy, meant so much." "The last year as you can only imagine has been an extremely difficult time due to the loss we have suffered, the horrific circumstances in which they died and the investigation that has brought us to this point," she added. What motivated a triple murder on a summer's night?